It's just another day in TrumpLand. 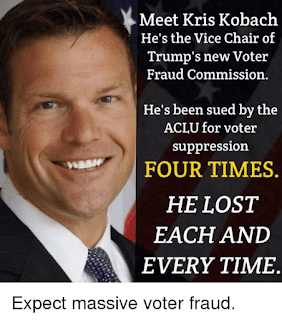 The last we heard from Kris he was busy working as the vice chair for the dubious voter fraud commission Trump created, without proof, claiming that millions of people voted illegally in the 2016 election. Kobach has also announced he's going to run for governor of Kansas. The Republican state official tapped by President Trump to lead his sketchy voter fraud commission was sanctioned by a federal judge Friday for his “deceptive conduct and lack of candor” in a voting rights case brought against him. Voting rights advocates are concerned that the so-called "Presidential Commission on Election Integrity (oxymoron alert!)" will be used as a cover to push restrictive voter laws like the one Kobach is currently battling in court to defend. Putting a wolf in the hen house never ends well for the chickens. Trump found his "wolf" in Kobach who is willing to cull the voter population to favor Republicans. We haven't seen the last of him despite this set-back. It certainly isn't going to bother Trump - or cause him to replace Kobach. Expect to see him as the Trumpie of the Month again in the near future.